Martin’s 20+ year professional journey has encompassed senior executive roles in global organisations including Anglo American Coal, SAB Miller, Hyundai & Volvo, Toyota, Bosal, and World Vision. As a management consultant, he has created case studies and CEO referenceable outcomes with numerous organisations including Mars, Macquarie Group, Peabody, Xstrata, MEC, Wavemaker, Sun International and the Queensland Government. He is a true global citizen having worked in no less than 42 countries on four continents. In one of his last executive roles, Martin had responsibility for 96 countries across the world. 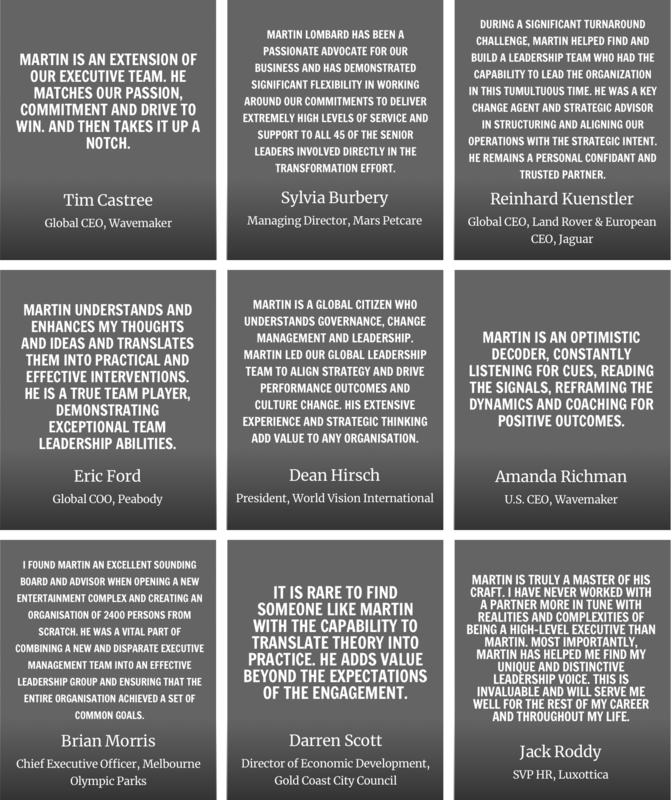 Martin has coached CEOs and senior executives all over the globe and has been a strategic advisor to dozens of executive teams. Martin’s many executive roles make him uniquely placed to advise senior leaders grappling with the complexities of change in the modern business environment. He has extensive expertise in organisational alignment, strategy, leadership, culture, public affairs, learning and development. He believes in the principle of lifelong learning and has an extensive global network of CEO and executive relationships that he continues to nurture to this day. Martin’s qualifications include a Bachelor of Economics from Stellenbosch and an Honours degree and Masters studies in Industrial/Organisational Psychology from UNISA. He has completed the Senior Executive Program at Harvard Business School, and is accredited in Human Synergistics tools, as well as a wide range of psychometric instruments including DISC and TAT (Thematic Apperception Test).